It was late summer. The summer the great forests burned throughout the lands North and West. We got in the car after some deliberation, after a sense of unease, after a feeling that the ghosts of the morning may not loosen their grip on the rest of the day, but I got in the car anyway. Bridge (we’ll call him that for all intents and purposes because lately he’s been a bridge between the light and the heavy) really wanted to explore the delta. The river spot had called to him for years. He had always imagined looking across the rail road tracks over where the tall trees grew, where the river called to be explored. I said, “Wow I’ve been thinking the same thing for years also!” which was true. Now we are walking, on the foot trail atop dike that contained and paralleled the river. We passed an older couple who didn’t engage until I said hi. Bridge looked tall, and good, and confident. Different to whom he had been previous the encounter with the optimistic wise woman. We continued on, seeking to break from the deafening trains and highway noise. This lead us over the decayed rail road bridge, and past the two teenage party spots, and further along the gorgeous river bank. The trail made it’s way through deciduous woods and then a clearing and began to disappear and reappear, to the left and then to the right. We had to duck numerous times under blackberry bushes that caught our hair and our clothes. We continued this way until at last Bridge found a spot where he was content. He was looking at an immense log jam stacked by the currents into a near traversable mass on closest branch of the river. I laid out my homemade neoprene picnic blanket (the traditional red checkered square pattern) on the bank and we munched on organic chips and carrots as Bridge Google-Earthed the delta. Sure enough, the log jam was against a little island on which he was determined to set foot. I sat in the cool shade and watched the immense volumes of water swirl deceptively slow, sparkling, reflecting dark and quietly. The trees rustled in the cool breeze, and yet still, in this idyllic spot, I could not stop thinking of Lights. (We’ll call him that for all intents and purposes because he still manages to illuminate my thoughts.) I hadn’t seen Lights in years, and we only communicated in a strange pictoral and telepathic way, indescribable because I had never experienced anything like it before. Bridge began to build a bridge. Precariously jumping between two long fallen trees, across a sizable gap of quiet, fast moving current, Bridge proceeded to balance, carry and throw 70lb plus logs to build a traverse back to the riverbank where I sat. I watched this as if watching a movie, detached and consumed by thoughts of Lights and his sublime influence, and of recent social theories adding beauty and nature to innate human needs. I soon snapped out of it and realized what a fun little adventure it would be to cross Bridge’s bridge, which I did. Then we jumped cautiously from log to log and emulated tightrope walkers across another by holding long branches. Once on the island, as our footsteps sank into the soft sandy bank, the beauty and privacy of the location began to take hold. I thought how Lights would also cherish this river landscape. We found a flat sandy spot near the banks with a generous vista down and up river and I laid my head on Bridge’s lap where he massaged my head and helped me focus my thoughts. Allow for receptivity, my mind repeated. Let this day on this riverbank be a gift from paradise, a gift from nature. We were both there at that moment, on a Friday, mid afternoon. We weren’t on a highway. We weren’t at work. We weren’t in our homes. I reached higher, higher, reaching for full receptivity. I quieted my mind and allowed for the gift as day. We took our clothes off, laid down his coat and made love. 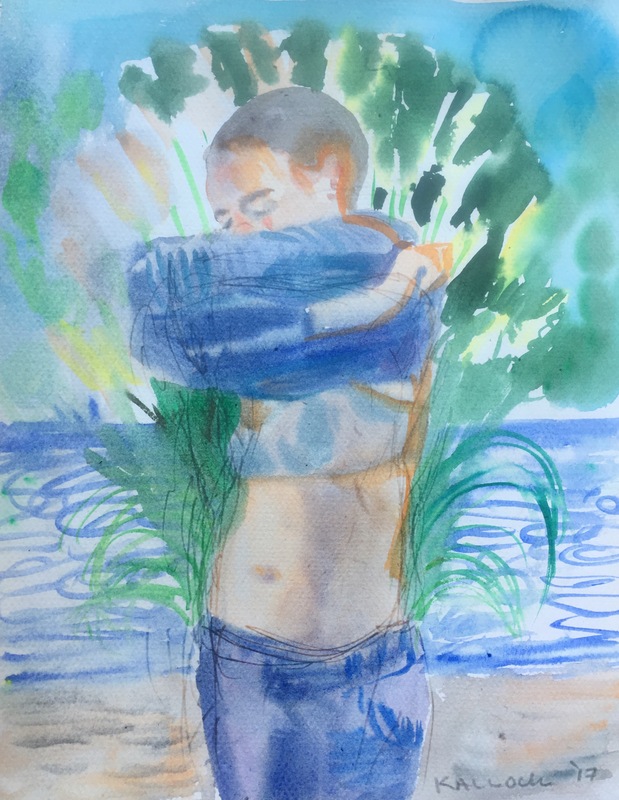 Love, Cry, Landscape, after the poem by Hadewijch of Antwerp, 13th c. watercolor on paper, 8 by 10 in. 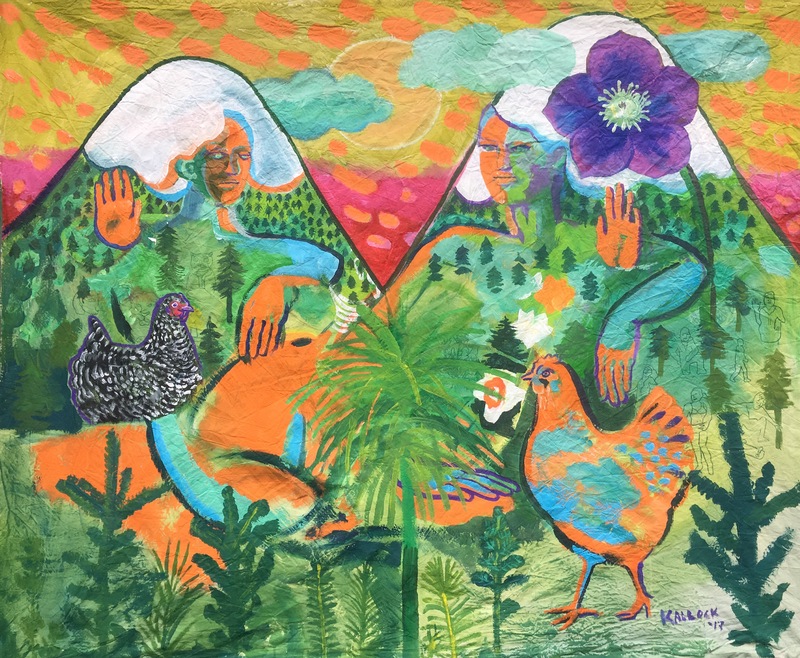 Emilia Kallock 2017 Woman as landscape and hills, connecting earth and humans as related ecosystems. The first painting is an illustration to the following poem from the 1200s by a woman from Antwerp. And makes me stray wild in a desert. The other sketch is about control, and the last two are about people coming together to talk about exciting new ideas.